MigraCam is a smartphone app designed to help people living in immigrant communities notify their family members and friends if detained by law enforcement in a raid or traffic stop. MigraCam works by recording these types of incidents and streaming them live to a list of emergency contacts. The app is available in English and Spanish and at no cost on Android and iOS devices. Stream video documentation in real-time to a list of pre-determined family and friends. Once the stream begins, they will be notified via text and e-mail. MigraCam will alert your list of emergency contacts of your location. This way your family and friends will have up-to-date information of your whereabouts. 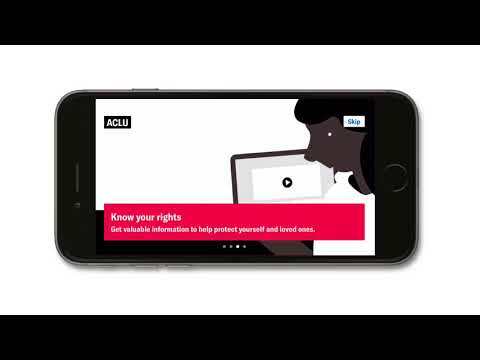 Watch valuable "Know Your Rights" information from ACLU of Texas immigration policy experts and legal staff. Stay up to date about how you can protect yourself in your car, in your home, and at the border. Receive updates and warnings from the ACLU of Texas and the ACLU Border Rights Center via push notifications. The app will display current warnings on the home screen. Older warnings are stored in the notifications tab. If voice command is enabled on your phone, you can simply say, "Ok Google or Siri, open MigraCam" to start the app. After ten seconds, your video will start streaming and your emergency contacts will be notified. When you donate through the app, you can help the ACLU of Texas keep MigraCam free, available, and updated. Still have questions? Read our full FAQ document.